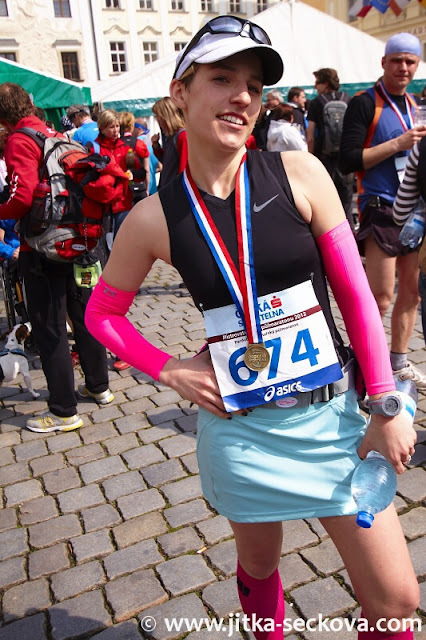 As you might have read in my previous post, I had special plan for Pardubice half marathon. I wasn't tapering prior to it and it was my 6th day in a row of quite challenging workouts. 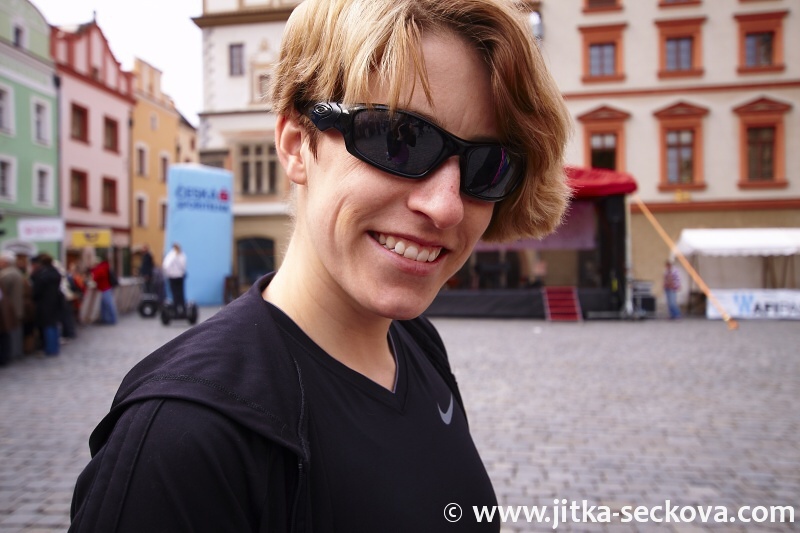 I should have been running with Jitka, but unfortunately she has a stress fracture, so I was on my own with no excuse. Well, there is The Coach, who made The Plan. Plan not that easy to stick to, since it pushed me to start really conservative and slow. How did I do? Photo by Jitka - check out here photo report from the race. Since my supposed starting pace for the first 5 km was quite slow (8:51 min/mile = 5:30 min/km) I didn't pay too much attention to warming up and stretching, because I knew the slowish pace will give me plenty of opportunity to warm up. 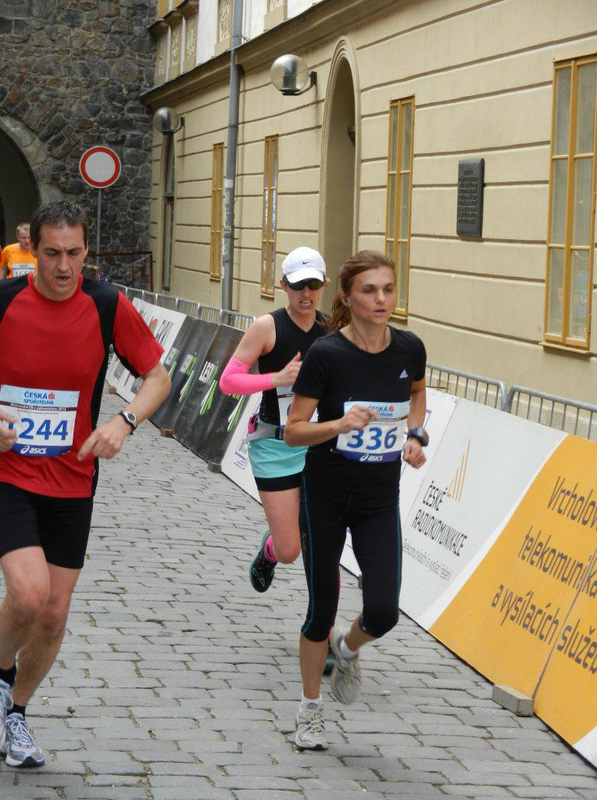 The starting field was relatively cosy of about 1200 runners, nothing to do with the crowds in Prague. I got my spot somewhere in the middle of the pack and was waiting for the starting gun to go off. The conditions were just perfect. It was supposed to be really cloudy with rain later in the afternoon. Not that bad as in Prague, but nothing pleasant. Finally, there was some sun and the temperature was little higher than predicted (around 12-15 degrees Celsius) = perfect running conditions. At Least for me, I knew as it was getting warmer, things were getting tougher for Leona. But I didn't have chance to see her until after the finish. The course were three 7 km loops in the city, which was super cool because the spectators could see plenty of action. There was also a section around the starting area where at around 3rd / 4th km we were coming back and seeing the people who were either ahead or behind. The starting gun went off and sooner than later I crossed the starting line (advantage of smaller races). I started at conservatively slow pace, but still I was too fast according to what The Coach planned for me. I did an inner pact with myself of going slightly slower than the supposed pace of the second 5 km (8:26 min/mile = 5:15 min/km). I maintained the pace around 8:30 min/mile and still was feeling strange because there were people passing me who shouldn't be passing me at all!!! I know I am a spoiled kid and this was tough on my attitude. I wanted to explain to everyone around that this is my training run and that is why I am going so slow. Not such a good idea, I know and fortunately I resisted the temptation to do so (almost every time). The crowd was cool and friendly and since my effort was relatively easy I had a chance to look around, smile and enjoy the atmosphere. I got a guy approaching me just to tell me that I look really cute in the skirt. Awesome! I know that this might sond silly, but people in the Czech Republic aren't really used to do such things. So I thanked him and told him that I wear the skirts to motivate other runners to run better (now I know thanks to Honza :o) ). I also met an English speaking blog reader asking me "Are you Barborka On The Run? ", that was awesome!!! I know your name started with "J", I am really bad at names, sorry for that. (If you are reading this, drop a comment or email me at: barborkas(at)me(dot)com.) That really lifted my spirits. I didn't use auto lap on my Garmin and pushed the lap button on every 5 km mark - that is how the course was marked anyway and it went well with dividing the four different section according to my plan (plus the tiny bit at the end). So the first "leg" of the race should have been at 8:51 min/mile (5:30 min/km), but I finally averaged at 8:30 min/mile (5:16 min/km). I was glad I didn't go faster than the supposed pace for the 5-10 km part. When entering the second loop of the race I saw Ondra coming towards me, cheered him like a crazy one, he was totally rocking it and I was little bit jealous that I "cannot". But I know this was for bigger picture of my marathon training. Back to Ondra, he really ROCKED this race! 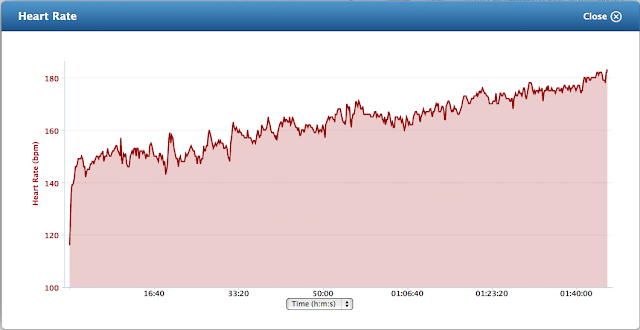 I was comfortably maintaining the pace just bellow 8:26 min/mile (5:15 min/km) through the 5th to 10th km. Honestly, I had some respect with the second half of the race. It was my sixth day of intense training in the row. What is more, I did a 10 km in 8:00 min/mile (5:00 min/km) pace on Friday evening and it didn't feel good at all. I was busy at work, went for a meeting on other side of town and at 4 pm I realized I didn't have lunch, so I got some fast food junk just to get some calories in. Lesson learnt, I won't do that any time soon again! I felt like throwing up on my Friday training the first 3 km, but as I was continuing with my run, I was feeling better and better. Yep, thank you running for making me feel better yet again! Back to the race, the second half was actually a blast. Honestly, I know it kind of isn't fair, but it felt awesome not being passed and passing people all the time. Yes I was passed by the elite, but that felt also awesome seeing them in action. Oh my God, the length of their steps!!! What a stride! 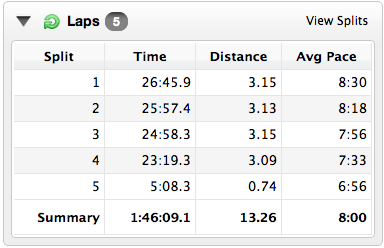 At the 8 min/mile pace, it was still decent passing yet another runner, and another. I remembered the Hungry Runner Girl's motto she has on the website: "It's rude to count people as you pass them. Out loud." I felt really good, took my first gel at about 10th km and the second somewhere between km 16 and 17. When I kicked in the high gear for the last 5 km, that was some fun. I fixed my eyes on the next girl ahead of me and the simple task to help me go with the pace was to pass her. My average pace between km 15 and 20 was 7:33 min/mile (4:41 min/km). The most fun was the final stretch after the 20 km mark. The mark itself was actually in a small climb, so I waited until I was on a flat surface and started picking up my pace. The good thing was that I wasn't that much worn off as I would have been, if I averaged around 7:30 min/mile (4:40 min/km) through the whole race. 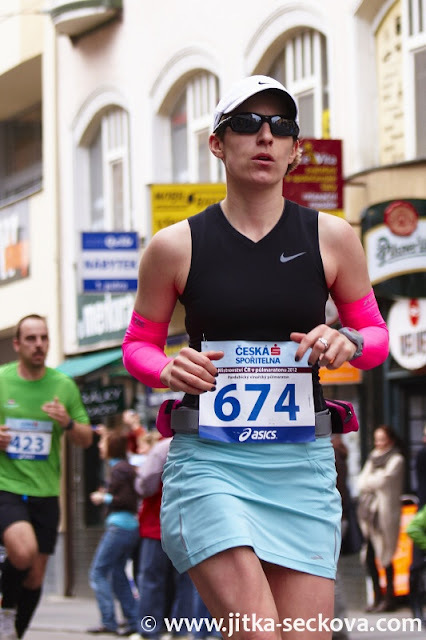 The other thing is that the speed training really gives you confidence, because I know that I can push myself pretty hard for the last 800 m even on really tired legs. Average pace for the last 1.1 km was 6:56 min/mile (4:18 min/km). Really happy about that. What is maybe more important was that my average heart rate for this bit was 180 BPM and peaking with 184 BPM. It has been quite some time since I have pushed myself this hard - pace wise and hear rate wise. 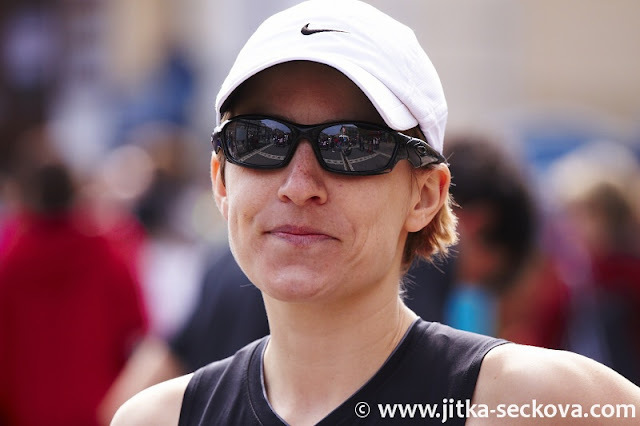 I met with Jitka after the finish line. She was saying something about how handy it is that my arm sleeves simply shine out from the crowd. 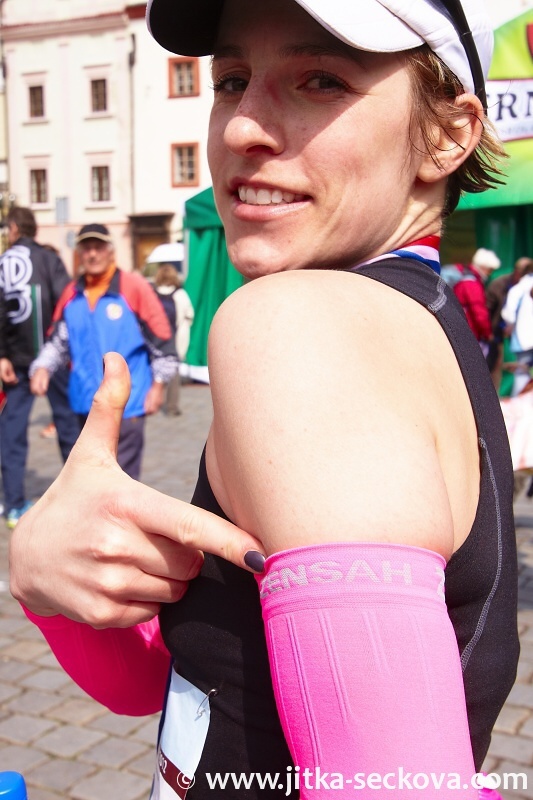 First race in those Zensah babies and felt really awesome! More detailed review will follow after I got more experience with them. We all met in a nice restaurant for post race meal and beer (non alcoholic for me as driver) and were off to Prague again. It is really cool to spend time with people who have the same addiction and passion as you have. We spent the whole way to Prague chatting about our training, the possible different approches to training, race plans and so on. Great race, great day, great friends!!! Thank you all! Ooops, I almost forgot to include my finishing time - 1:46:09, 575th overall (1190 finishers), 45th woman, 20th in my category. But this race wasn't about time and age group podiums, it was about fun and friends! So far, I am loving these pink babies. Chilling out after the race with friends, very cool day indeed! And yes, my iPad goes wherever I go and has pink cover. Thank YOU!!! Congrats with your great time, great race - and as I read it: a great day with friends and fellow runners! there were people passing me who shouldn't be passing me at all!!! Yep, I am one spoiled kid with an attitude, but I am not afraid to admit it :) Thanx!